I spent the earlier part of last week shedding my winter coat with the Gillette Venus Swirl™ razor. I would love to say “no judgment” as a southern gal never develops a winter coat, but it has been cold and I had no desire to shave my legs every day. Seeing as how I have been hiding out in cozy pants and sweaters, there was no need. (I also moved during the month of February and my razor has yet to appear among the boxes.) However, North Carolina is known for its changing weather and we jumped from 40 degrees to the 70’s and I needed to clean my act up in a hurry. Imagine you’re Magilla Gorilla and you want smooth legs for a cute dress. That’s your mental image for this review. Gillette and WalMart reached out to me to ask if I’d like to give the new Gillette Venus Swirl™ a test and I took it as a sign. I headed to the shower with my new razor and the Gillette Venus Olay VioletSwirl™ Shave Gel, took a deep breath and got to work. The Olay® VioletSwirl™ shave gel was a pleasant surprise. I don’t normally use a shave gel because I find their fragrance overpowering and fruity. VioletSwirl™ is subtle, without that cheap candle mimicking spring scent. Here is where I noticed the differences. I have been a Gillette Venus user for a long time (years). It is a great razor. But the Venus Swirl™ beats the Venus by a long shot. 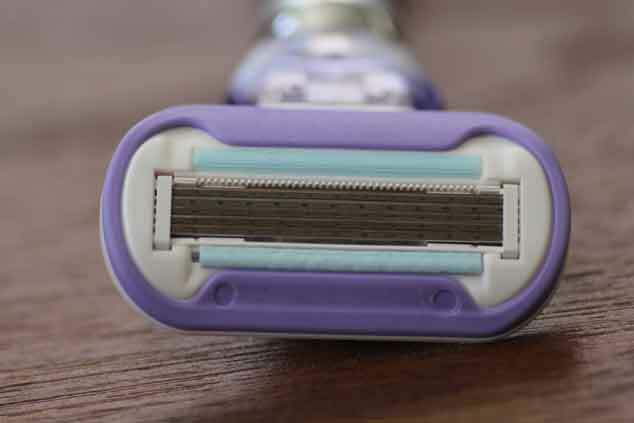 Venus Swirl™ is the first Venus razor to feature Gillette’s most advanced blade technology, with five Contour™ blades that cut hair at lower cutting force and have thinner, finer edges — the thinnest in Gillette’s history. The Contour™ blades individually adjust to a every curve and contour. What really sold me was VenusSwirl’s™ new Microfine Comb and five Contour™ Blades. Pesky knee and ankle hairs and other tricky areas are no match for it! The comb grabbed hair you might have missed at the back of your knee and guides it to the blade. The visuals were almost too much for me it works so well. Where can you find this magical winter coat pulverizer? Look for the entire collection of VenusSwirl™ products in the shave aisle at your local Walmart store or at venusswirl.com. Do you want to give the Gillette VenusSwirl ™ and Gillette Venus Olay VioletSwirl™ a try? I’m giving away a $20 Wal-Mart gift card so you can pick up your own VenusSwirl™ products today. Giveaway ends March 30, 2015, at midnight. Disclosure: This post was sponsored by SheSpeaks/Gillette Venus. I’m pretty sure the world at large is thankful for their intervention. Previous Post: « Honey, I’m Home.